Angela grew up in leafy suburbs of 1970s Melbourne, Australia. After studying animation at the Queensland College of Art, In 2000 she settled in London, where she spent 10 years working in film post-production as a 3D artist on major blockbusters including V for Vendetta, The Hitchhikers Guide to the Galaxy, and the Harry Potter. Angela loved the film studios of Soho but grew frustrated at how months’ of work would often only amount to a few fleeting seconds hidden away on a cinema screen or TV. After having children, longing to return to the tactility of drawing, she found the direction she was looking for in the in-transience of wallpaper, incorporating her love of storytelling and elements of surrealism into her designs. 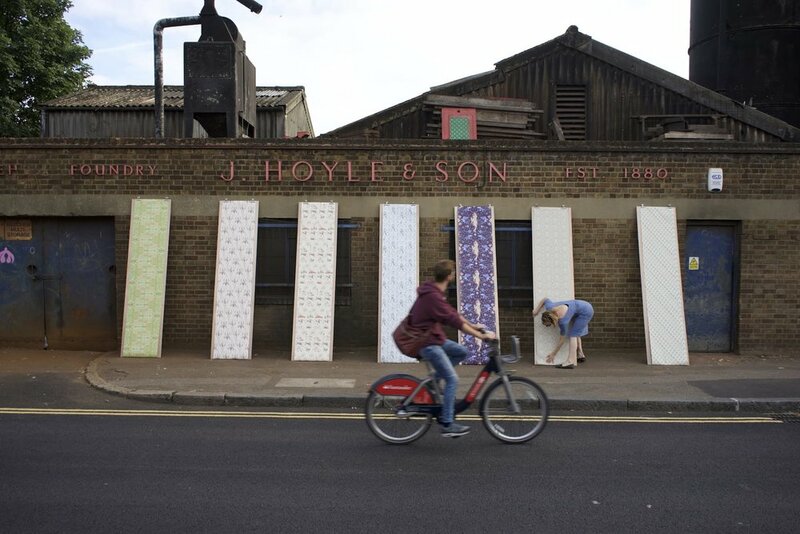 In 2012, Angela’s wallpapers worked with the interior designer Lady Ray behind east London’s Electric Star pub group, who commissioned her to create a narrative wallpaper for the newly revamped Star by Hackney Downs public house. From here she went on to create a series of custom designs for other London pubs and local arts projects such as Hackney Council’s gallery and events space, Hackney House. She also received a number of commissions for major brands including Chivas Brothers and the national charity, Age UK. On the back of the success of Angela’s wallpapers, including a London Gold Award from DRIVEN x DESIGN and international press coverage in The Wall Street Journal, Angela Groundwater Limited is now going through a period of rapid growth, expanding its product portfolio into interiors and drapery, with a range of upholstered furniture and soft furnishings soon to be launched, and a collection of 1970s kitsch-inspired retro loungewear in the pipeline for later this year. All well as her bespoke service all her original patterns (including some of her collaborative designs) are available to purchase £150 (per .52 by 10 metre roll) and are proudly designed and made in the UK.